Six months after the premiere of Grass at the Berlinale, prolific auteur Hong Sangsoo is back with another black and white drama which once again reunites him with his leading actress Kim Min-hee. 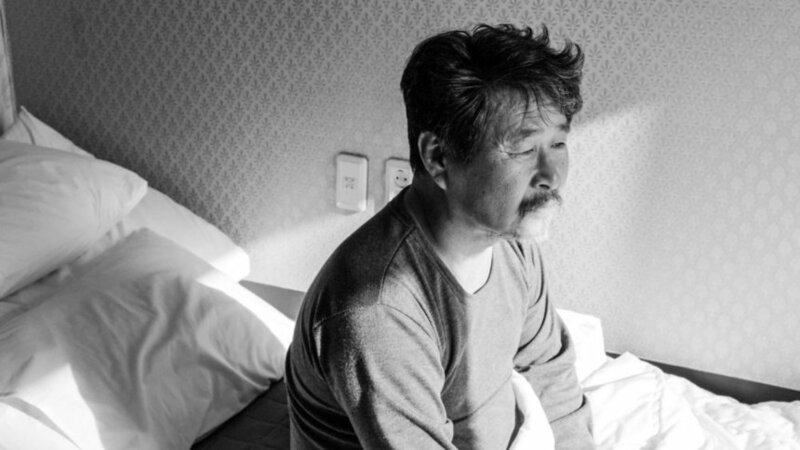 Having just debuted at the Locarno International Film Festival, where it picked up the Best Actor Award for lead Ki Joo-bong, Hotel by the River employs less narrative trickery than most of the director's films and builds from a series of slight vignettes into a moving story of an ageing poet trying to take stock of his life in what may be his waning days. Young-wan has been staying for free at a hotel along the Han River for two weeks during the winter season, after meeting its owner who happened to be a fan of his work. He asks his two grown-up sons to come and join him for the day. Also staying at the inn is Sang-hee, a young woman who is taking refuge there after a bad break up with her lover. Her friend visits in order to console her. Rather than the brief musical interludes that typically play over the simple credit titles at the start of a Hong film, Hotel by the River features an unidentified man's voice announcing the film's shooting dates and then reading out the film's credits. While arguably a small change, it seems to speak to the straightforward nature of the story that will unfold. All of Hong's usual themes are evident, as is his narrative penchant for mirroring and long-take conversations, whether accompanied with copious caffeine or alcohol, in a story that features the filmmaker's favored character types, the middle-aged intellectual grappling with his conscience and the younger woman making sense of a messy relationship. Yet the story that unfolds moves away from the seesaw of idle chat and playful anecdotes we've grown accustomed to, as it explores one man's life, both through his introspective musings and the dribble of familiar biographical details that his children allude to in their talks, which, as the sober day makes way for the drunken night, become more confrontational and revealing. Since appearing for the first time in Right Now, Wrong Then, incidentally the last Hong film to appear in Locarno, where it won the top prize in 2015, Kim has been the lead of six of Hong's last seven films. However, though she is once again on top form and as inscrutable as ever, for the first time in Hotel by the River her character plays second fiddle to another protagonist. Sang-hee's romantic experience, which is not described in any detail, may well be another form of Hongian mirroring. If we look at the filmmaker's body of work it is likely that Sang-hee was a man's mistress who was suddenly dumped. As Young-wan's story wears on, we learn that he also destroyed his marriage, likely for similar reasons. She also bears a mysterious burn on her wrist, which is first noticed by Young-wan as he gazes at her strolling through the grounds from his window in the opening scene. Sang-hee's arc seems to reinforce Young-wan's, and furthermore adds weight to the feelings of remorse he appears to be grappling with. Hong regulars Kwon Hae-hyo (The Day After) and Yu Jun-sang (The Day He Arrives) quickly establish an easy brotherly bond as the poet's sons which is built on a foundation of affection, petty rivalry and patriarchal devotion. Over the different stages of the day's family conferences, the pair play off each other brilliantly as they hint at their characters' buried anxieties. That leaves the formidable Ki Joo-bong, another Hong acolyte (Hill of Freedom) who is currently also turning heads with an extended cameo as a head of state in the espionage drama The Spy Gone North. The actor brings together warmth, uncertainly and just a hint of arrogance in a role that explains little but shows so much. It doesn't hurt that Young-wan is one of Hong's most fully formed characters, but for the veteran Ki, this surely stands as a high point, and a justly rewarded one as the film successfully quick off its festival run. Ki has been on a roll in the indie scene of late, leading the Chaplinesque Merry Christmas Mr. Mo to delightful effect in 2016 and leaving his mark with an assured role in last year's The First Lap. As ever, Hong fans should delight in another collection of increasingly coy and mischievous exchanges but while Hotel by the River is unlikely to grant him too many new converts, the clear presence of a beginning, middle and end may offer an entry point for the more narratively demanding viewers out there.